In nature elk meet their nutritional needs by roaming to find plants, licking on mineral deposits and other plant material and consuming fresh, clean water free choice. Elk farms now confine elk to dry lot paddocks or pastures. Our product choices support feeding elk either free choice or scheduled feedings. Many people believe that animals know what their bodies need. In nature they would find it. Farm or ranch elk certainly can’t roam far to meet their nutritional needs. We offer products that support free choice feeding for your elk herd. SweetPro’s Elk Lick Tubs: SweetPro Elk Blocks are an all-natural, non-molasses, non-starch free-choice lick tub. It contains protein, vitamins, minerals, yeast, live enzymes, pre-biotics, and diatomaceous earth (which may help with parasite control). It comes in a 225lb tub. EquiLix: Some of our elk breeders choose to feed the horse version of the SweetPro products, known as EquiLix. EquiLix provides biotin for hooves (and antler growth), more Vitamin E and added ground flax to provide more immune system support and improved skin/coat quality. EquiLix comes in 50lb, 125lb and 250lbs tubs. EquiLix PI is intended for owners seeking higher product intake or for picky eaters that do not consume the standard EquiLix at the necessary rate to provide nutritional benefits. Redmond Naturals: Redmond Naturals offers sea salt with over 50 trace minerals in a Redmond 44lb Lick Block version. The Redmond Lick block comes in 8 different types. 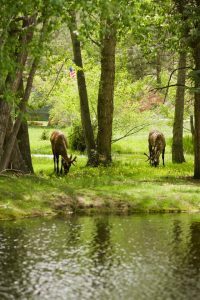 Fresh Start with Diatomaceous Earth: If you prefer to feed your elk in a bunker setting our suggestion would be to feed SweetPro’s Fresh Start with diatomaceous earth or the EquiPride. Fresh Start is an all-natural, non-molasses, non-starch loose supplement that is intended for hand feeding. Fresh Start contains all the protein, vitamins, minerals, yeast, live enzymes, pre-biotics and diatomaceous earth for your elk’s nutritional needs. Fresh Start can be ordered in 50lb bags or 2,000 lb totes. EquiPride: EquiPride is SweetPro’s horse top dress intended for hand fed situations. This product is just like the Fresh Start, but contains added Vitamin E, biotin, and ground flax for added immune system support. It also is available with diatomaceous earth. Redmond Naturals: Redmond Naturals provide a sea salt and volcanic ash (toxin binder) conditioner in hand-fed bagged versions. The salt and conditioner and is available in 50lbs bags or 2,000lb totes. Mountain Sunrise Hay Pellets: Mountain Sunrise makes all natural (no additives/binders) hay pellets in alfalfa, various types of grass hay (Bermuda, Bermuda plus, oat, and timothy) and a combination of alfalfa/Bermuda, alfalfa/oat and alfalfa/timothy. We offer 8 kinds of hay for you to choose from in 50lb bags. We also carry the Mountain Sunrise 80/20 pellets that contain 80% alfalfa & 20% corn, also in 50lb bags.